SOCIAL MEDIA LACKING IN AUDIENCE GROWTH ? When you exchange your hard earned money for goods or services, you want to feel confident that you’ll receive the outcome you deserve. Purchasing a product or service requires a certain level of trust between the provider and the consumer. That trust can be built and nurtured in 100 different ways, but in 2017 the easiest way to show your potential customers that you are an open and honest (aka trustworthy) company, is through social media posts. There’s a ton of scientific evidence that documents how humans can view an image and figure out what is going on, very rapidly. We use context clues to put together the ideas behind the image, much faster than we could read it’s description. Plus, images can be downright appealing. On social media you can use images to send a message, and you should try to do it in a pleasant manner. When using images in Marketing or Advertising, you’re not replacing a message entirely — you’re supporting it. You want an image that tells the story behind your quote, tagline, or offer. But, if you’re not a graphic artist,or skilled photographer, what can you do? Luckily the wonderful folks over at Canva have made creating attractive images for digital media, a breeze. Check out this quick tutorial, recorded by our social media team (less than 5 minutes!) 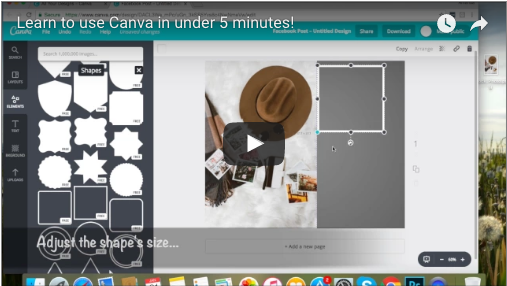 to see how you can use Canva to make you’re own gorgeous creations.